President Trump spoke on Monday in Miami about the political crisis in Venezuela and the dangers of socialism. 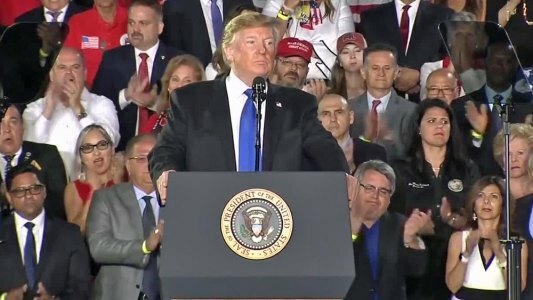 The President delivered a speech to a crowd of mostly Venezuelan Americans on the campus of Florida International University in Miami. President Trump also called for dictator Nicolas Maduro to step down and for Venezuelan troops to allow humanitarian aid from the U.S. into the country. “They are risking their lives and risking their future for a man controlled by the Cuban military.” The president said. The President also welcomed on stage the mother of Oscar Perez, who was shot and killed by Venezuelan Police after staging a protest against the government. President Trump also expressed support for Juan GuaIdo, who declared himself the new interim leader of Venezuela last month.